Thanks to all who voted for me! I got honorable mentions! It's a little disappointing to not even win a mouse pad, but I appreciate all the help from everyone. Particularly: Lauren, Alex, Kristy, Garrett, Mira, Ben, Damian, Kuya, Andrew, Tom, Ken Ken, Jeremy, and whoever else helped promote my poster through their blogs, and facebook. Here's another pretty picture as a token of my appreciation. What doesn't kill you makes you stronger Alvin. You've officially gained a level because of this. For a quick last minute submission, I think you did rather well. Next time don't forget about it until the day it's due. Lol. 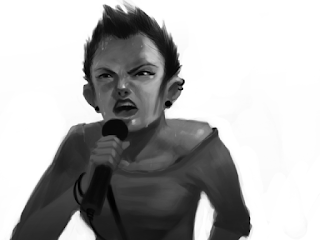 Nice expression on the singer. At first I thought it was a girly dude wearing his gf's sweater or something. i totally thought this was a guy too! one of those "pretty boys" you are always talking about... but then I noticed it wasn't!